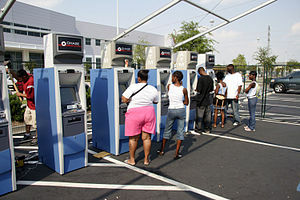 An image of portable ATMs out in front of a supermarket. Interesting subjects are very good for the mind. How do you see yourself with interesting subjects? Do they stimulate your mind, body & soul? Do those subjects come from fresh ideas or from other people’s posts that get you thinking more & more about what to do with them? Do you crave enough about them you will go to any means available to get what you need to make your own post? I am always looking for good subjects to write about. When I find a great subject that interests me, I am always jumping in with both feet using my mind, body & soul. These type of subjects are what get me started thinking & craving what I need to make a blog post. Good subjects are great for the mind which help to imagine & create what you want to post on your blog encouraging you to be the best you can be. Mindsets are a great way when needing to start a blog post giving you the time & space to get thoughts to come to you as you are posting. Posting means that you have fresh ideas coming from your mind & you are allowing them to be put on your post letting others see what you are all about. Setting your mind to what you plan to do helps focus for the day, week, month & year just like setting goals, too. Subjects I am interested in are Internet Marketing, Credit Repair, Debit Cards, Loans of all kinds, Living on More Than a Fixed Income, Preparing Yourself for a Better Tomorrow, Having the Freedom That You Never Had While You Were Growing Up, Learning About Making an Income Through Different Channels, & Telling Others How These Changes Make a Big Difference in Your Life. I am starting with the subject of Internet Marketing. Internet marketing is nothing more than taking control of your life & being able to sell yourself to others. These are to friends, lovers, acquaintances, family, and others that you are related to that tell their friends, lovers, acquaintances, etc. under you. This is how I see the ways of Internet marketing working for those gurus who are at the top of the money chain or highest mountain. They make you believe in what they are doing is so great that you will jump into what they are doing to get out of your comfort zone & try what they are trying. This is so good when people are willing to try something different which allows them to see how well they will do as they take chances or risks to become more than what they already are. Spending money is good, too! I believe that there are differences & options that we can use when we are desperately working on making more for ourselves to become like those top gurus. Marketing can be done off the Internet too as you sell yourself or ideas to others also. This is what life is all about! Credit Repair is a subject I got into because I was helping others learn about how to restore their credit. This is nothing other than returning your credit from bad scores to good scores again! There is a lesson to be learned though! Don’t get into so much debt that you can never find jobs that will give you a good income, because those businesses that give that money & pay you use your credit rating to keep you from getting a job or even considering you for a job! There are a lot of ways to get your credit rating back to normal or better than what it was. One way is using a website I use to help get your credit better. I enjoy it & also helps with loans, getting a home or houses, debit or credit cards, buying products or items & more. They give away a free website when you join their business. They don’t believe in taking money from you, but help you when you try out the products and services they put on their website. They even have a blog to help when you need to comment, too! There is a chat window to talk to live operators who will help you when you need questions answered right away! There are free resources to see & use to guide you through what you need or just email my boss to get those tough questions answered that aren’t in their FAQ section. Here is the website: http://allsolutionsnetwork.com/RG/RG98674/. Check it out, try it out & make a difference in what you do & how you can save more! This is a big difference & change in my life! Check her out on Fubar when you friend her & join!